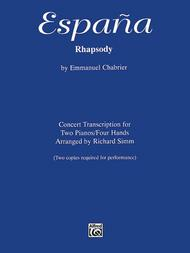 Concert Transcription for Two Pianos. Composed by Alexis Emmanuel Chabrier (1841-1894). Arranged by Richard Simm. This edition: 2 copies required. Duet or Duo; Masterworks; Piano Duo (2 Pianos, 4 Hands); Solo Small Ensembles. Latin; Masterwork Arrangement; Romantic. Sheet. 40 pages. Belwin Music #00-PA9602. Published by Belwin Music (AP.PA9602). What an exciting arrangement this is! 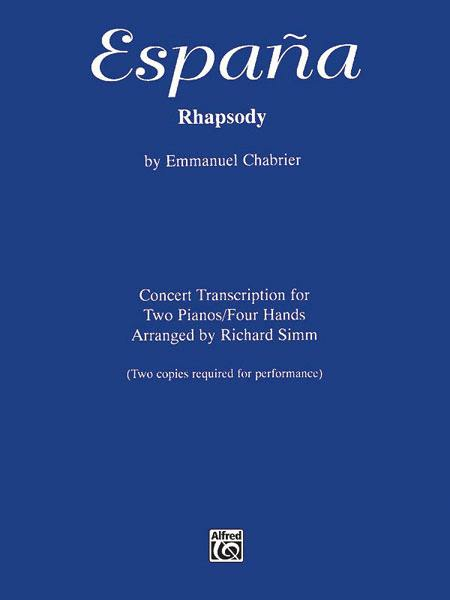 Chabrier's popular Espana comes alive at two pianos in this wonderful arrangement by Richard Simm. Drawing directly from the orchestral score, Simm uses the full resources of the piano to create a setting which will be fun for the pianists and audiences as well. It will require some technical work by the pianists, but the ensemble works easily together. A must!